MASS TIMBER. WARMTH. LIGHT. JOY. We've created an intimate building where small businesses can grow and thrive. At Albina Yard you'll get to know your neighbors and you may even end up collaborating. We offer small and medium size spaces just waiting for you to get to work. We've set it up so your workspace will run itself while you focus on running your business. High ceilings, abundant natural light from floor-to-ceiling windows and loads of exposed wood make you feel inspired and productive. Cutting edge heating and cooling along with automated lighting reduce your carbon footprint. Access the building anytime with a secure card reader. Feel like working outside or hosting an event? A shared conference room opens onto a lovely courtyard. Albina Yard is at the north end of the Mississippi Avenue district, one of Portland's most thriving and diverse neighborhoods. With old and new architecture the area has maintained it's original eclectic feel and pedestrian scale. The street is a major bike corridor with public transit and easy access to the I-5 freeway. Bars, restaurants, shopping and one of the best food cart pods in Portland are just steps away. Office spaces are fully finished and move-in ready. Just bring your desk. Each space has automated LED lighting and an individually controlled heating system for greater energy savings. Most spaces are outfitted with a small kitchenette and conference room. Check out the floor plans below. WE ARE CURRENTLY FULLY LEASED. CALL OR WRITE TO INQUIRE ABOUT FUTURE AVAILABILITY. Send us your email address and we'll reach out to you. CONSTRUCTION IN THE UNITED STATES. TIMBER PANELS MADE IN OREGON. When considering ways to reduce our carbon footprint, we didn't just stop at a super high efficiency heating system. 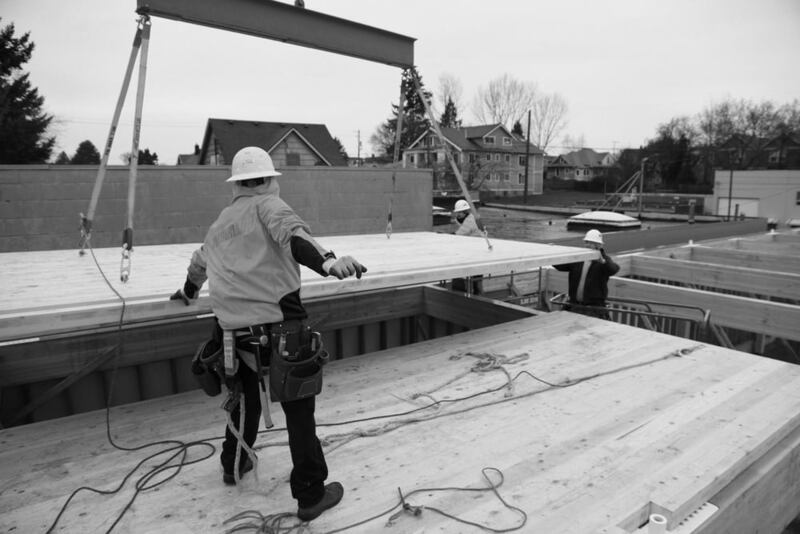 We turned to mass timber construction – with a glue-laminated timber frame and featuring the first use of domestically fabricated cross-laminated timber panels (CLT's) for a building-wide structural system in the United States. That's innovative. CLT's hold great promise for revolutionizing the construction industry by redefining how wood is used in large buildings. The sustainable harvest of small diameter trees used for engineered wood products sequesters atmospheric carbon and is a boon for regional forest economies. These panels can replace steel and concrete in multi-story construction while maintaining seismic integrity and fire resistance. And, you'll love the space they create.